​Do you have to be mental to be a vegetarian? ​Although many studies have been conducted about the association between a vegetarian diet and physical health, very little work has been done on the associations between a vegetarian diet and mental health. And as more people are persuaded that a vegetarian diet is a healthy diet, it is essential that they are made aware of the possible adverse effects of such a diet. This latest study adds to previous evidence that concerns about the healthiness of vegetarianism are well-founded and need to be taken very seriously. A small but increasing number of people - now a considerable minority of populations in Western - countries are choosing to restrict meat in their diets or cut it out altogether for various reasons. During the past decades, increasing knowledge has emerged about the effects of vegetarian diet on nutritional status and physical health. Taken as a whole, studies have shown that vegetarians are in good physical health compared with national averages and as healthy as non-vegetarians with a comparable background and lifestyle. Many different processes could, in principle, produce differences between vegetarians and meat eaters in rates of mental disorders. On a biological level, nutrition status resulting differences in nutrient intakes from a vegetarian diet may affect neuronal function and synaptic plasticity, which in turn influences brain processes relevant for onset and maintenance of mental disorders [3,4]. For example, there is strong evidence that long-chain n-3 fatty acids causally affect risk for major depressive disorders [5,6]. Also low vitamin B12 levels appear to be causally linked, not only to brain shrinkage, but also to major depressive disorders. Studies have reported that vegetarians show lower tissue concentrations of long-chain n-3 fatty acids [7,8] and vitamin B12 [9,10] which may elevate the risk for major depressive disorder. Besides differences in nutrition status, vegetarians and non-vegetarians differ in a number of psychological and socio-demographic characteristics that may influence their risk for mental disorders. Vegetarians are predominantly female , are more likely to live in urban areas and to be single . All these factors are correlates of the presence of mental disorders . Moreover, vegetarians tend to be more aware of the factors influencing their dietary intake and of the importance of a healthy lifestyle in general, they tend to define themselves negatively by emphasizing what they do not do; they tend to stress their dissimilarity from others and thereby accentuate their differences from the general society . Thus, some psychological and socio-demographic characteristics of vegetarians, such as negative self-definition and dysfunctional eating attitudes, could have detrimental effects on mental health. To be fair, any associations that may be found between vegetarian diet and mental disorders could be attributable to several possible causal mechanisms:. developing a mental disorder increases the likelihood of choosing a vegetarian diet, in which case the onset of the mental disorder would precede the vegetarian diet. Although published findings on that type of relationship are missing, it is conceivable that individuals with mental disorders are more aware of suffering of animals or may show more health-oriented behaviours (e.g. adopting a vegetarian diet) in order to positively influence the course of their mental disorder. 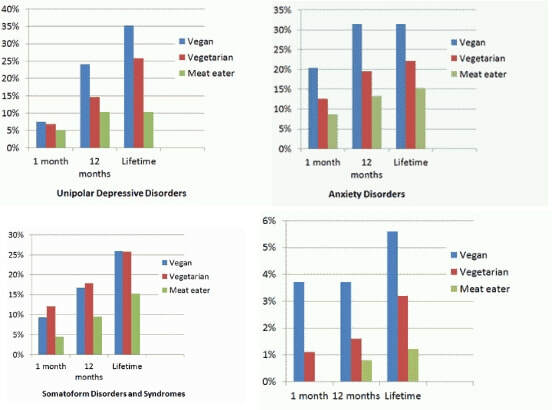 Shown in the figures below are the 1-month, 12-month and lifetime prevalence rates of mental disorders in participants who were completely vegetarian, predominantly vegetarian, and in non-vegetarian matched samples. As you will see, the 12-month and lifetime prevalence rates of depressive disorders were nearly 15 % higher in the completely vegetarian group compared to the non-vegetarians. As could be expected, prevalence rates of individuals with a predominantly vegetarian diet were somewhere in between the other two. Consumption of food products by individuals with and without mental disorders showed a very consistent pattern: individuals suffering from a depressive, anxiety, or eating disorder as well as from a somatoform disorder and syndrome consumed less meat. This pattern emerged for 1-month, 12-month as well as lifetime prevalence rates. Analysis in a subsample of non-vegetarians also consistently showed that people suffering from a mental disorder also ate less meat than people without a mental disorder. On the whole, the results of this study strongly corroborate the past findings in smaller samples of adolescents and young adults, which have demonstrated that in contrast to physical health, a vegetarian diet is not associated with better mental health. Whether compared with a control group of non-vegetarians matched for important socio-demographic characteristics, or with non-vegetarians in general, vegetarians show elevated prevalence rates of diverse mental disorders. Either way, studies like this and many others demonstrate clearly that vegetarianism may have some serious consequenses affecting the brain. 3.Young G, Conquer J. Omega-3 fatty acids and neuropsychiatric disorders. Reprod Nutr Dev 2005, 45:1-28. 4.Mandelsamen Percica M, Delas I. Essential fatty acids and psychiatric disorders. Nutr Clin Pract 2011; 26:409-25. 5.Freeman MP: Omega-3 Fatty Acids in Psychiatry. A Review. Ann Clin Psychiatry 2000; 12:159-165. 6.Logan A. Neurobehavioral aspects of omega-3 fatty acids: possible mechanisms and therapeutic value in major depression. Altern Med Res. 2003; 8:410-425. 7.Sanders TA. Meat or wheat for the next millennium? A debate pro veg. Proc Nutr Soc 1999; 58:265-269. 8.Sanders TA, Ellis FR, Dickerson JW. Studies of vegans: the fatty acid composition of plasma choline phosphoglycerides, erythrocytes, adipose tissue, and breast milk, and some indicators of susceptibility to ischemic heart disease in vegans and omnivore controls. Am J Clin Nutr 1978; 31:805-813. 9.Herrmann W, Geisel J. Vegetarian lifestyle and monitoring of vitamin B-12status. Clin Chim Acta 2002; 326:47-59. 10.Kwok T, Cheng G, Woo J, et al. Independent effect of vitamin B12 deficiency on hematological status in older Chinese vegetarian women. Am JHematol 2002; 70:186-190. 11.Larsson CL, Klock KS, Nordrehaug Astrom A, et al. Lifestyle-related characteristics of young low-meat consumers and omnivores in Sweden and Norway.J Adolesc Health 2002; 31:190-198. 12.Baines S, Powers J, Brown WJ. How does the health and well-being of young Australian vegetarian and semi-vegetarian women compare with non-vegetarians?PHN 2007; 10:436-442. 13.Jacobi F, Wittchen H-U, Hölting C, et al. Prevalence, comorbidity and correlates of mental disorders in the general population: Results from theGerman Health Interview and Examination Survey (GHS). Psychol Med2004; 34:597-511. 14.Back KW, Glasgow M. Social networks and psychological conditions in diet preferences: Gourmets and vegetarians. BASP 1981, 2:1–9. An interesting study was published in 2009. In confirming earlier research, it showed conclusively that people who cut down on eating foods of animal origin — and particularly vegans who cut it out altogether — suffer quite a large degree of brain shrinkage.